This monograph, first of its kind, surveys the female sculptures created by Indian artists through centuries, from an ancient era of Indus Valley Civilization to medieval times. Archaeological data is interpreted in the light of literary and cultural traditions of India. 'This work is not only a book about art, it is also an important document that has captured the significance of woman in traditional Indian society and richness of her life as she enacts her part in the drama of social life. 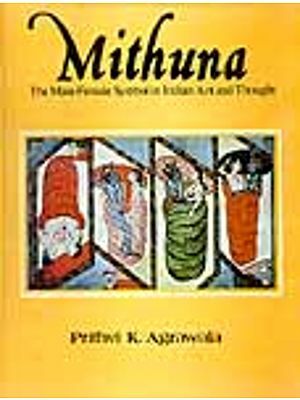 Thus in addition to depicting women and the beauty of their form, this book provides the readers with glimpse in life and cosmology of ancient India. 'The reader is treated to range and variety of woman in all her manifest forms, from gentle to beautiful to wild and terrible'. 'The author has stressed the image of Indian women as icons of fertility, bounty and fruition.
' 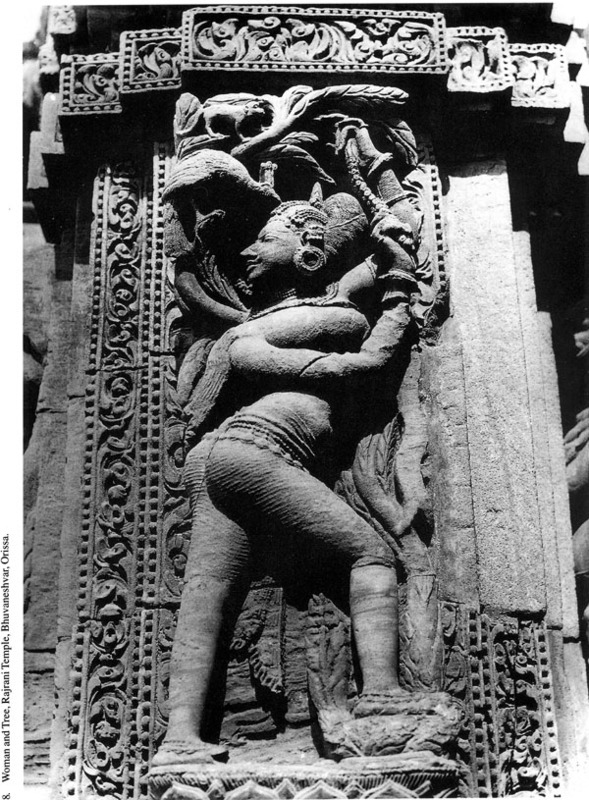 Various images the sculptors conceived of her as Mother Goddess, Yakshi, Devangana and Surasundari, Lover par excellence, One as found of Wine, Dance and Music, Shringara Nayika, paragon of Beauty and Intellect and also embodiment of forces of death and destruction, and made into sculptures, are described here in very lucid language, to give the readers an insight into Indian art. 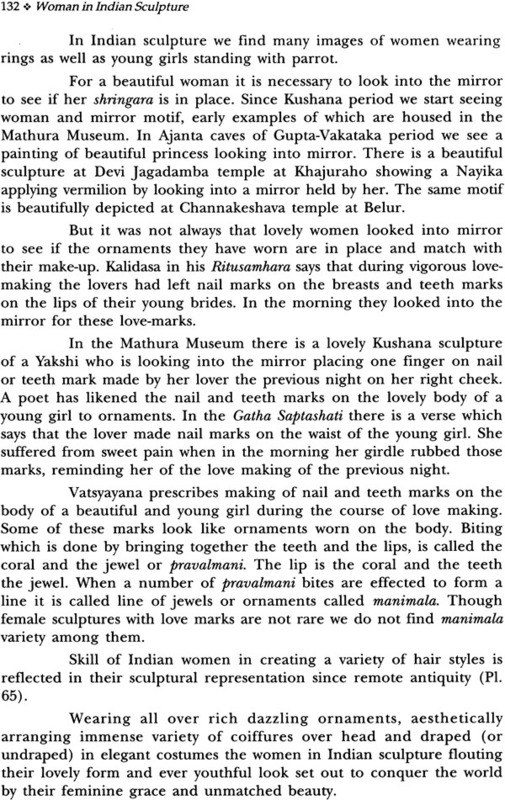 This volume on the Woman in Indian Sculpture has stressed the image of the Indian woman as an icon of fertility, bounty and fruition. 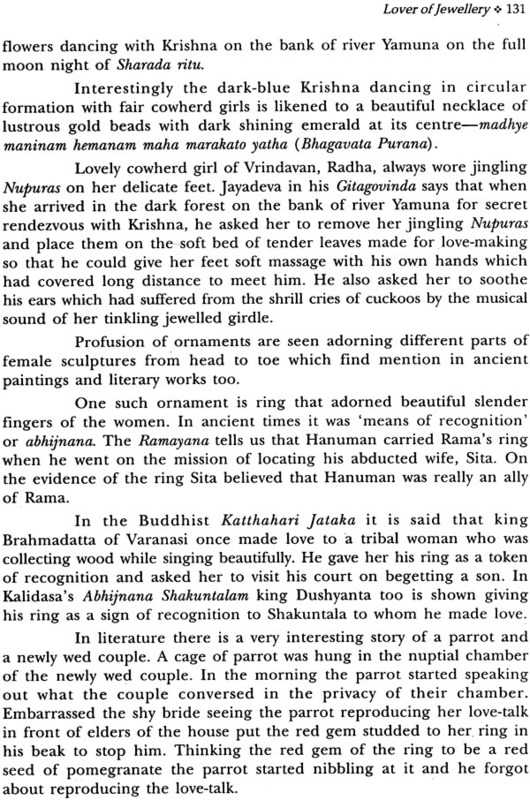 The author has written about the poetic conceit of the woman and the tree, quickening each other to flower and fruit, about yakshis apotheosizing the life impulse and vibrations of nature, about nayikas epitomizing the various games and overtures of love, and, about dancers and musicians, entertaining people or their gods. 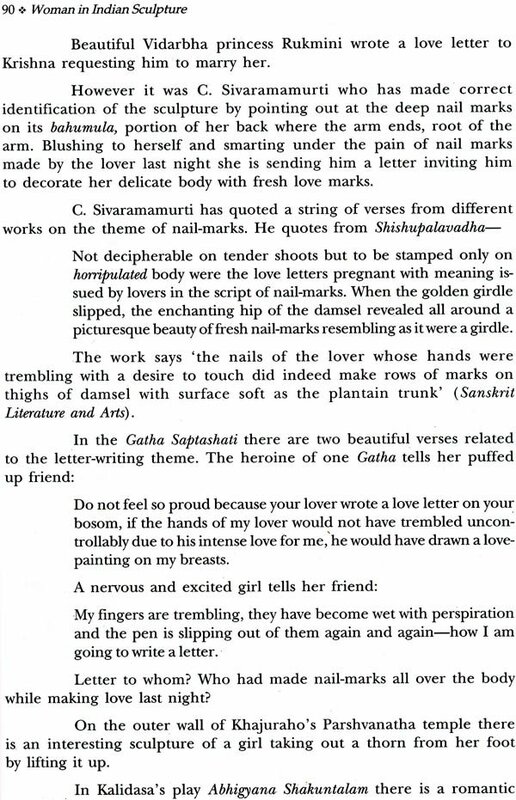 He has illustrated the image of the Indian woman through allusions to literature and the arts. The goddess, in her beneficent or terrible beauty, complements the image of woman as a creative and procreative person, a creature of nature and culture. Even though the author has offered an exposition of the conventional and popular view of the Indian woman, he still offers clues to help us transcend this view, and to explore the myriad possibilities, fulfilments and longings of Indian womanhood. The female form is a delicate topic that can easily be misrepresented to border on the crass. It takes a scholar of the range and depth of M.L. Varadpande to execute this theme with the sensitivity and vision that one finds in this work. Varadpande has collected material in the form of photographs and descriptions of icons and sculptures from ancient India and embellished them with a text that speaks volumes about the range of knowledge possessed by the author. The writing is based on sound scholarship yet entertains with the simple beauty of its prose. This book illustrates the manifold dimensions of woman's life in ancient India and her symbolic and cosmological significance. The nayika of Sanskrit literature is here captured in the splendour of her visual beauty. 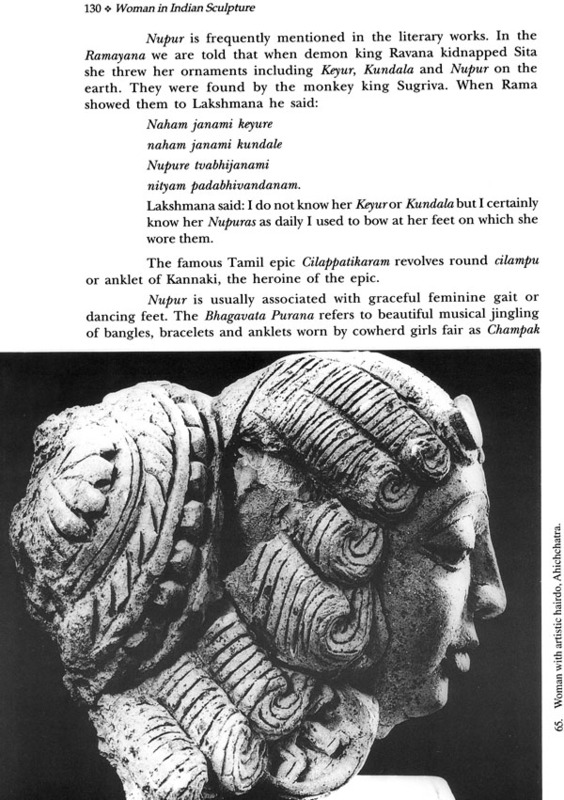 The myriad of forms in which the woman appears in Indian sculptures illustrate the multiple faces of her personhood and roles played by her in society. This work is not only a book about art; it is also an important social document that has captured the significance of woman in traditional Indian society and the richness of her life as she enacts her part in the drama of social life. 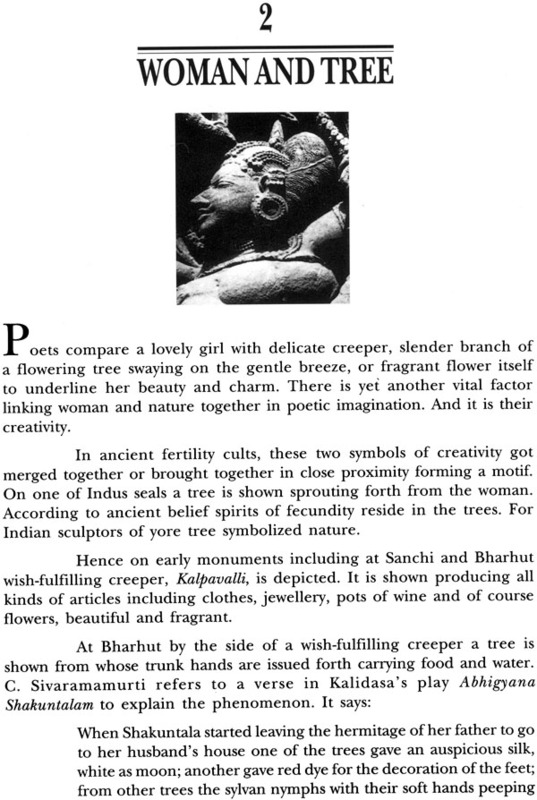 Thus in addition to depicting women and the beauty of their form, this book provides the reader with a glimpse into life and cosmology of ancient India. The reader is treated to a range and variety of the woman in all her manifest forms, from the gentle and beautiful to the wild and terrible and yet in each form she is captivating and fascinating. The collection of photographs that accompany the text are of a high quality. In describing them the author has drawn upon the history of art, literature, mythology and his own interpretations. The term form is not limited to the external morphology only but to the inner dimensions of the woman, her emotions and qualities of mind and intellect. Woman is not a mere object but a symbol of the qualities of the universe of life and its energy, both creative and destructive. She is mother, lover and destroyer, embodying in herself both the positive and negative forces of the universe. This book illustrates the broad vision about women in South Asia and its culture and religion. 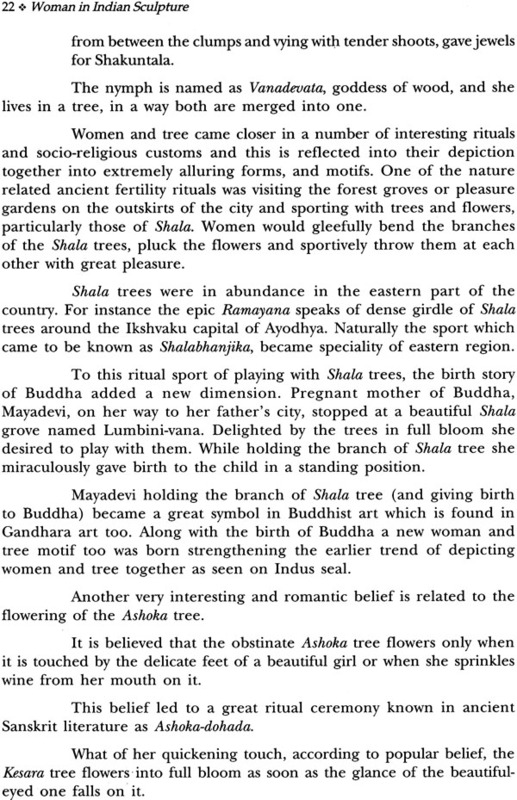 The sub- stratums of this culture were based on the worship of the Mother- goddess. 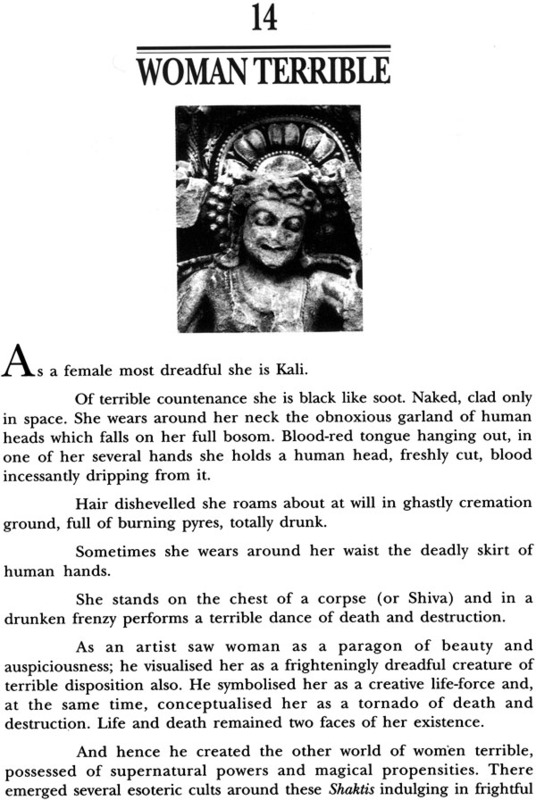 Woman has never been trivialized in this region but has been an object of awe and worship. In the patriarchal world of today this book gives a glimpse of a past where woman still reigned in the splendour of her form. This is a rare book that entertains as well as educates.